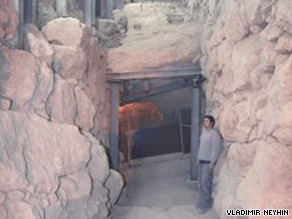 Archaeologist: "I don't know how to do it today without mechanical equipment"
"This is the most massive wall that has ever been uncovered in the City of David," Reich and Shukron said in a joint statement about the find. It marks the first time "that such massive construction that predates the Herodian period has been discovered in Jerusalem." It appears to be part of a "protected, well-fortified passage that descends to the spring tower from some sort of fortress that stood at the top of the hill," according to the joint statement. The spring "is located in the weakest and most vulnerable place in the area. The construction of a protected passage, even though it involves tremendous effort, is a solution for which there are several parallels in antiquity, albeit from periods that are later than the remains described here." Such walls were used primarily to defend against marauding desert nomads looking to rob the city, said Reich, a professor at the University of Haifa. "We are dealing with a gigantic fortification, from the standpoint of the structure's dimensions, the thickness of its walls and the size of the stones that were incorporated in its construction," the joint statement said. Water from the spring is used by modern inhabitants of Jerusalem. "The new discovery shows that the picture regarding Jerusalem's eastern defenses and the ancient water system in the Middle Bronze Age 2 is still far from clear," Reich said. "Despite the fact that so many have excavated on this hill, there is a very good chance that extremely large and well-preserved architectural elements are still hidden in it and waiting to be uncovered."